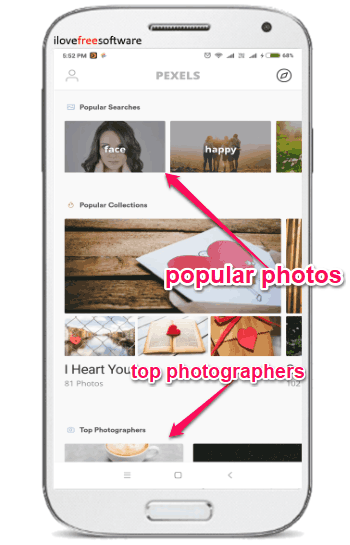 Pexels for Android is a free app that can help you browse and download thousands of royalty-free photos for free. After downloading photos from this app, you can use them anywhere you want like on your personal or commercial projects, blogs, games, etc. without even providing any attribution to the creator or the app. It allows you to explore trending photos, popular search categories, and popular collections. 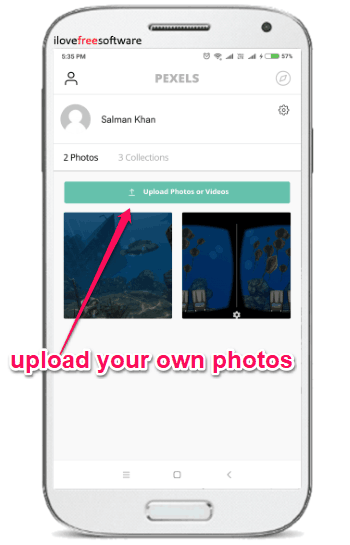 Then you can save the photos to your own collections, download, like, or share with others. 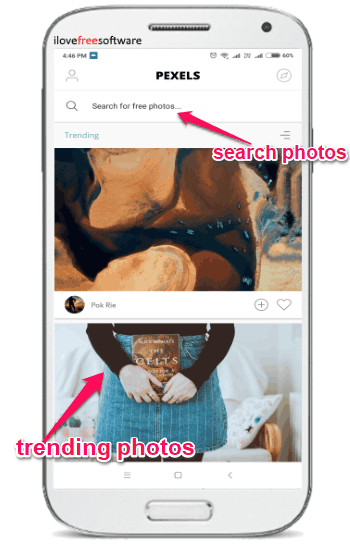 It also allows you to search for any photo you want in categories like Music, Sports, Project, Texture, Cloud, or anything you can think of. There are other useful options in this app like you can resize photos before downloading, set photos as wallpaper, and even upload your own photos to Pexels. You can also follow top photographers to see their photos and download them for free. If you like royalty-free photos than you must have used or heard of Pexels. It is one of the best free websites to download royalty free photos and royalty-free videos. But earlier, it only had the web version and now they have launched this free Pexels app for Android. To get started, simply install the “Pexels” app from Google Play Store. The link is given at the bottom of this post. After you do that, open it up and sign up for a new account. Once you do that, you can see all the trending photos on the main screen. At the top, you will also see a “Search” bar using which you can search for any photo you want. To see the popular searches, popular collections, and top photographers, all you gotta do is tap on the small icon visible at the top right corner. As soon as you do that, it will open a new screen where you can see separate sections for them. There you can browse through the popular photos, follow photographers, etc. Once you find a photo which you want to download, simply tap on it to preview. At the bottom of the preview screen, you will see the options to like the photo, add to your own collections, and download. 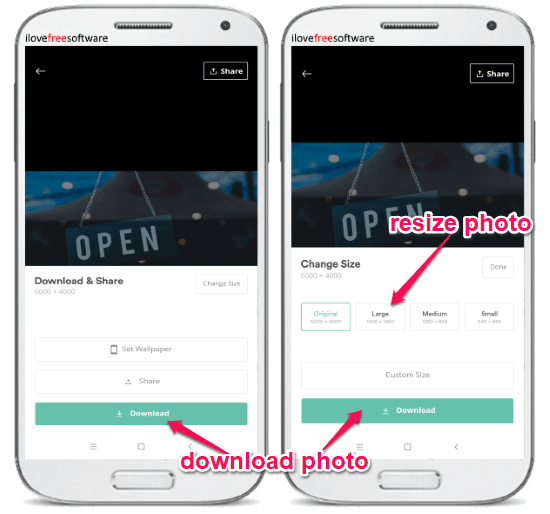 When you select the “Download” option, a popup will appear with the option to download the photo, share, or set as wallpaper. If you want to download the photo, then it will also allow you to manually resize the photo by selecting any of the pre-defined resolutions. All the photos which you like, download, or add to your collections can be seen on your profile tab. To access the tab, simply tap on the “Profile” icon visible at the top. There you will also see a “Photos” tab under which you will find the option to upload your own photos to Pexels. 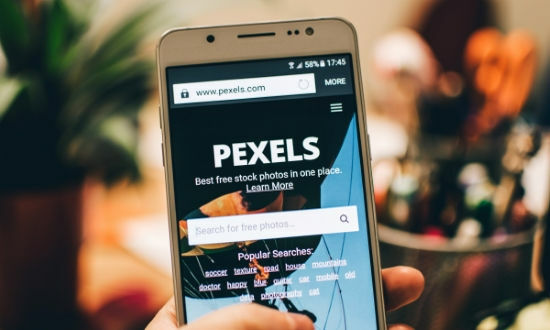 Do note that the photos you upload are reviewed by the creative team of Pexels before making them live. Pexels for Android is a very useful and interesting app which can take care of all your photos need. It lets you easily browse through a vast collection of royalty-free photos and download them to use anywhere you want. You don’t have to spend a penny or even give credits to the photographers who created the photos you download. What makes this app interesting is that you can upload your own photos directly from your phone to show off your creativity to others. Download “Pexels for Android” from here.